Oh my giddy aunt! Cambridge parkrun was a complete mudfest. In fact, it was mud with stilts on! Never in the entire world history of muddy races has it been muddier. 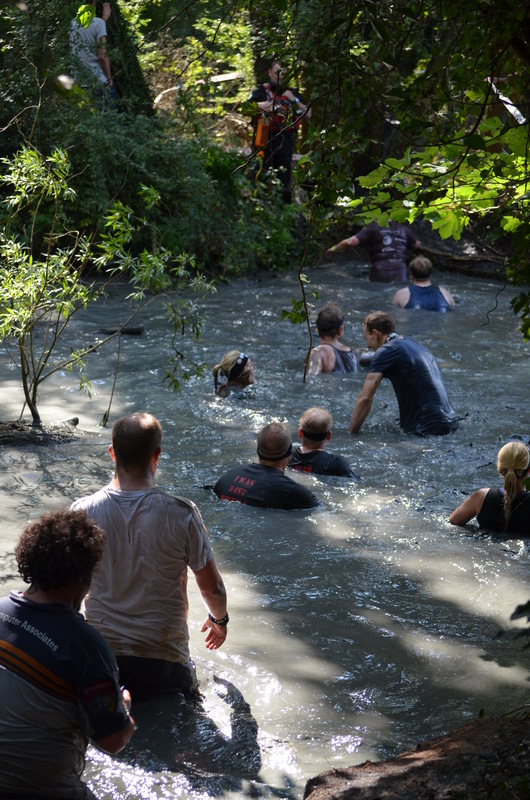 These magnificent parkrunners are wading through thick, gloopy mud up to two metres in depth. Can you believe it? No, not really. This pic was taken at one of the Spartan races in August 2014. Nevertheless, it accurately reflects today’s parkrun conditions (almost). When it was announced there would be a 25 minute pacer for the 5k race, my expression remained unchanged but I treated myself to the equivalent of a mental snigger. As if I would require the services of a 25 minute pacer. Possibly a 21 or 22? Unfortunately, around half way, the lad with a huge 25 on his hi viz top breezed past me with his posse of followers and that was that! I was left eating non existent dust. I was moderately consoled when I looked at the results page. Most people, including the winner (nice chap) finished about 2 minutes off their best times. It was raining as well and the temperature seemed to be dropping. I didn’t really warm up despite being dressed for the weather. I collected the signage around the course after the race so, for the purposes of Janathon, I walked an extra 2k. Cambridge junior parkrun tomorrow. The conditions will be poor with ice and/or fog predicted. Last week they ran a modified course rather than cancel it and hopefully they will be able to do so again. 1. Look upon tabloid readers more kindly and appreciate that there is a wide gamut of perspective and opinion. I’m struggling with the first one! This entry was posted in Am I Being Unfair?, Brussels sprouts, Exercise and heart disease, Grumpiness, Heart disease, Janathon, junior parkrun, miserable weather, New Year resolutions, parkrun, Running, running races, running with heart disease, Spartan obstacle races, Uncategorized and tagged exercise, heart disorder, Janathon, mud, parkrun, running, volunteering at parkrun. Bookmark the permalink. I won’t be doing one either but they are great to watch. I was amazed at the level of enjoyment people showed as they struggled through the swamps. The women found it particularly empowering. Have a rethink about doing one! I am concerned about the future of the world’s Brussel sprout supply. I hope that you only eat Brussels from a sustainable source. Knowing how you feel about tabloid readers I went back and put an apostrophe in.